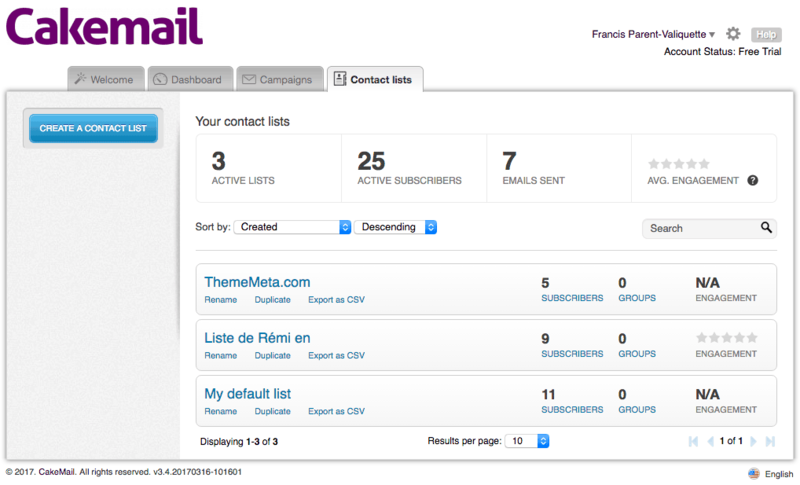 Cakemail Module for PrestaShop - Synchronize PrestaShop users with Cakemail lists! 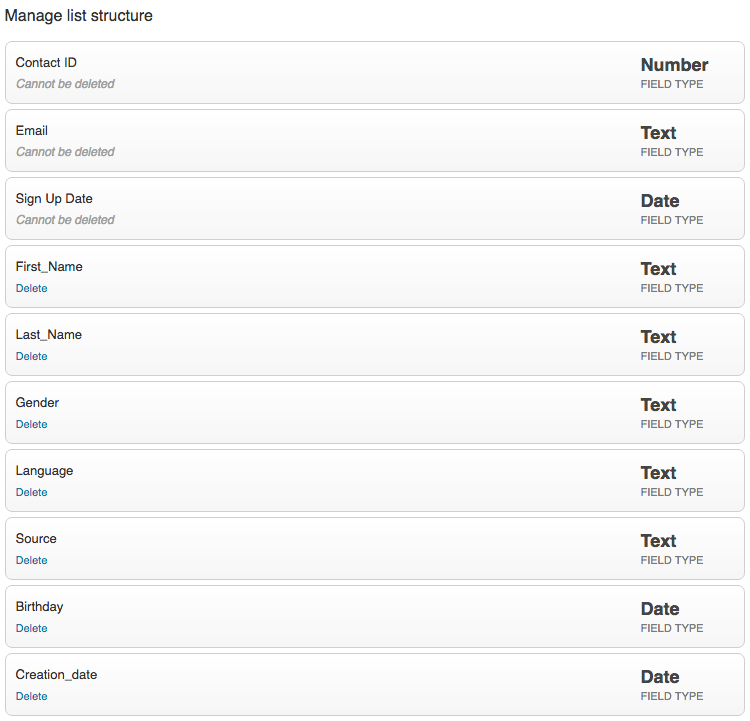 Synchronize PrestaShop users with Cakemail lists! PrestaShop Cakemail Inc. Varmédia Inc. Refer to official instructions to install this module. You need to be able to connect to your Cakemail account. You will need an API key, that is a chain of digits and letters with which to link our module to your Cakemail account. That key contains no personal information and can be revoked or changed at anytime. You will have received it from the Cakemail support team. Do feel free to use this text. Hello, I need an API key to link the Cakemail module (unofficial) for PrestaShop to my account. 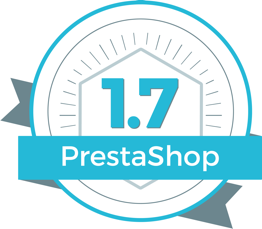 Developed by Varmedia, this module will make it easy for me to synchronize my PrestaShop customer list with your service in order to send my messages to my customers. The first time you click on "Configure", you will be guided to configure the two first tabs, [API] and [LIST]. 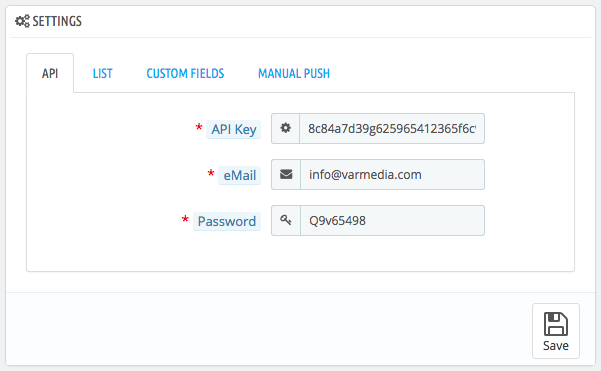 Fill in the "API key", "Email" and "Password" fields. For more information, refer to the "PREREQUISITE" section of this document. Don't forget to press "Save". Select your Cakemail account list to be used for this shop. You will probably want to create a list in your Cakemail account especially for this PrestaShop shop. Otherwise, use the default list or any other list appearing in this menu. You will have to exit the module or disconnect from PrestaShop if you make changes to your Cakemail lists. 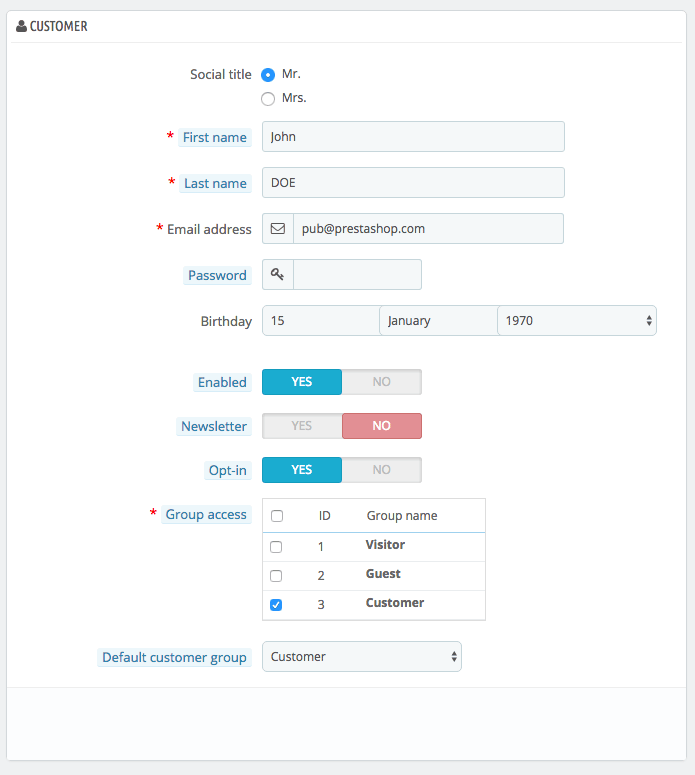 Check this box for the module to send changes automatically to your Cakemail list every time one of your customers updates their contact information. Leave unchecked if you prefer to do that manually. Initially, that option is not selected for security purposes, but we recommend that you activate it. 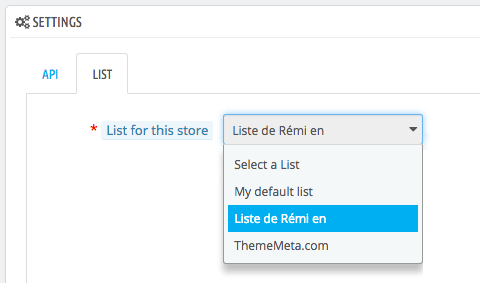 The fields available in PrestaShop are accessible via the Clients menu and the corresponding submenu. These are the fields you will match with those of your Cakemail list. NB: Clients who do not wish to receive the newsletter will not be included in the synchronization. Match the custom fields at left with those of your shop. The Custom text field will replace the content of the matching field with this one. For example, if you're using a Cakemail list that does not contain only your shop contacts, you might want to identify the source by creating a field of the same name. To change them, go to your Cakemail account in the [Contact lists] tab, and then, in the menu at left, click "Manage list structure". 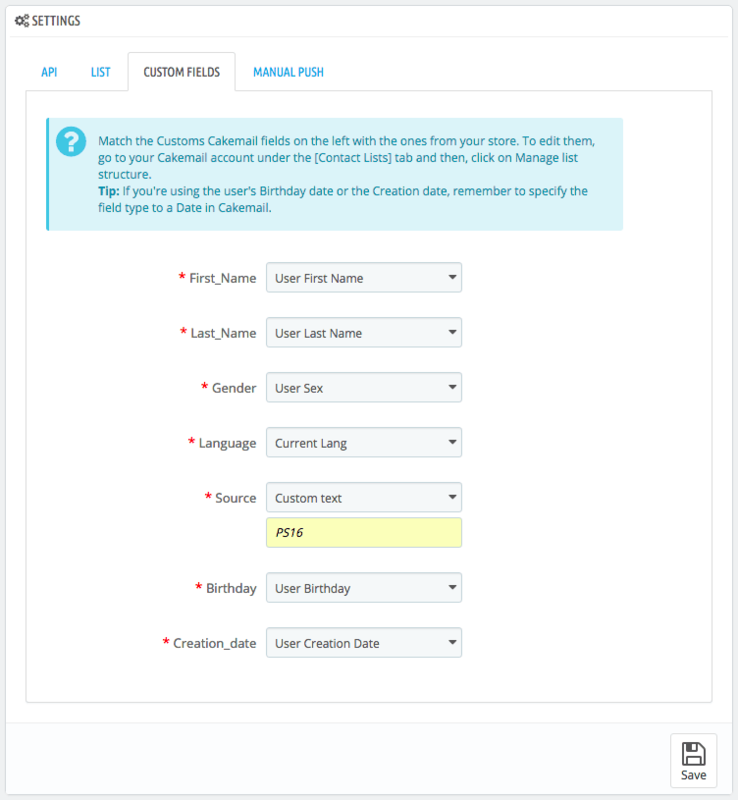 Tip: For a birth date or account creation date, don't forget to specify the field type Date in Cakemail. If the "Automatic" box is not checked in the [LIST] tab, you have to click "Go!" to launch a synchronization of your list. This button is also useful to update the list since the last time the Automatic check box was disabled in the [LIST] tab. We worked very hard for this module to work flawlessly. Feel free to write to us if you have comments, suggestions, or if you need our support. We are not affiliated with Cakemail. To contact their support team, click here.